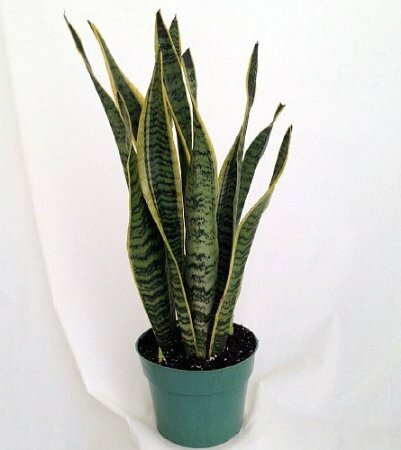 Size: 6" Growers Pot Sansevierias or as they are commonly called Snake Plants or Mother-in-law's Tongue have a rich history of folklore and new science. These plants have a rich history of cultivation. In China, it was kept as a treasured houseplant because the Eight Gods bestowed their eight virtues on those who grew them. These virtues include long life, prosperity, intelligence, beauty, art, poetry, health and strength. The plants were kept near the entrances inside the home so that the eight virtues could pass through in a manner pre-Feng Shui. These plants also were placed in fine restaurants, herbalists, acupuncturists, doctor's offices, accountant's offices, banks, shrines, monastaries, and even in rice paddies. Sansevierias were grown and cherished well before the Chinese ti plant (Dracaena spp.) also known as the Good Luck Bamboo! The sansevieria is also referred to as a dragon for its many unique qualities. As with many Asian martial arts techniques, the strength comes from within. The sansevieria has been known to split large earthen pots upon reaching larger sizes. The Chinese have usually kept this plant potted in a pot within a ceramic pot often ornated with dragons and phoenixes. The attraction of this plant towards dragons is said to be magnetic. An interesting research program has been done by NASA using a few selected plants (one is Sansevieria) for air purification and to curb "Sick Building Syndrome." Growing the Snake Plant is easy. It will thrive in very bright light to almost dark corners of the house. Just water when the soil is dry.